Employees today want to be able to choose their own mobile devices based on their preferred design and functionality, a trend known as “bring your own device,” or BYOD. Frost & Sullivan research shows that a growing number of employees are using their personal mobile devices for business purposes, with or without approval or support by IT or management. 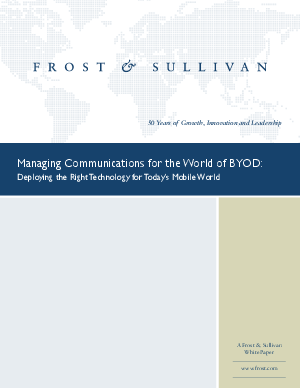 This can be a boon to the organization, but it is also a risk; Frost & Sullivan recommends that companies leverage the BYOD trend by extending corporate communications to their employees’ mobile devices. Learn the Risks and Benefits today!